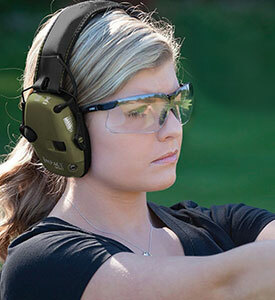 The Honeywell Store features an unrivaled selection of Safety and Security products that range from Honeywell Safes, Honeywell Door Chimes, Honeywell Door Locks and an abundance of other security enhancers that offer the maximum in peace of mind. 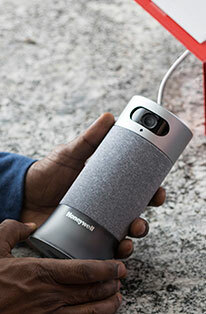 For this entry, we will primarily be focusing on Honeywell Digital Security Door Locks and how they can be instrumental in buffering the overall security of your household or place of business. 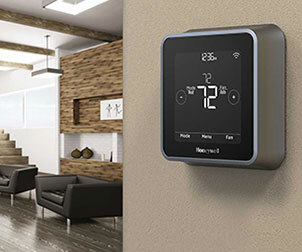 Honeywell Digital Security Door Locks range in both design and function. The Honeywell Digital Door Lock and Deadbolt in Satin Chrome was created with user accessibility in mind as owners will have the option to set up individual codes for multiple users. This opens up an absolute wealth of options to explore as users will be encouraged to strengthen their security system through customization. 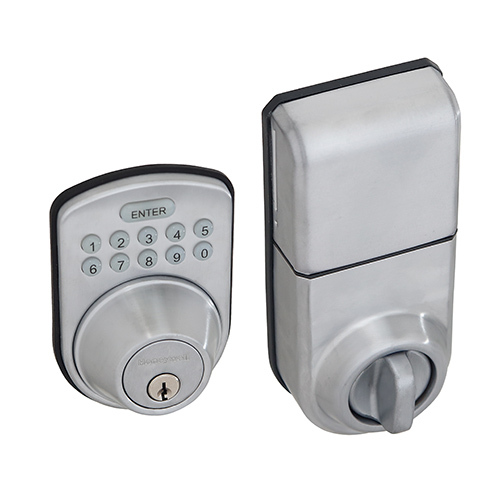 This set includes a backlit keypad that automatically lights when being used and a specifically designed pin tumbler configuration that provides added protection against unauthorized "bump key" entry. Additional features such as an adjustable latch, mounting hardware and a drilling template assure an effortless installation process. Every Honeywell Digital Door Lock can also easily be rekeyed by locksmiths in the event of an emergency. Tested by the ANSI (American National Standards Institute) to surpass standards for residential security, Honeywell Digital Security Door Locks are a premier defender in safeguarding your home or place of business. 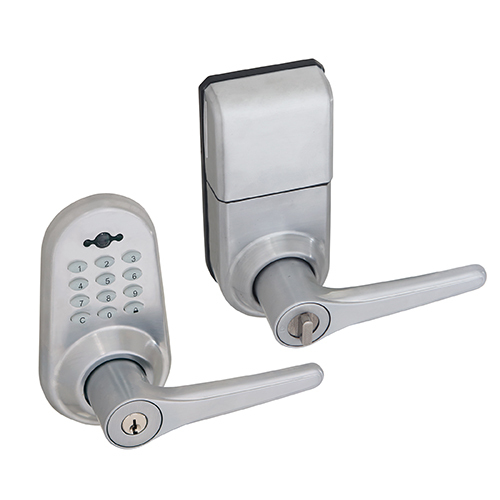 Additional options such as the Honeywell Digital Door Lever Handle Set Lock with Remote in Polished Brass offer even more versatility to an already inherently flexible security enhancer. 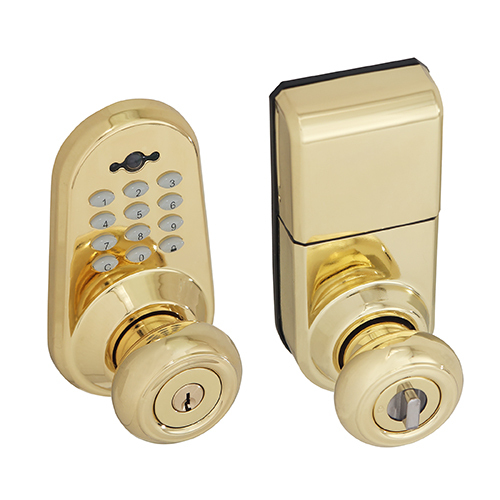 Featuring all of the strengths of the previous model, this option includes a set of polished brass door handles. 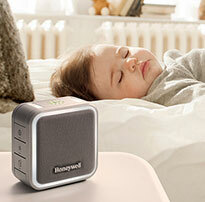 The Honeywell store has also included the Honeywell Digital Door Lock Entry Knob with Remote in Satin Chrome. The availability of both handles and knobs will allow home and business owners to select the perfect accessory to complement their front or back door. The entirety of Honeywell's selection of Digital Security Door Locks is backed by a mechanical and finish limited lifetime warranty. Not only does this assure the maximum in peace of mind, it proves that Honeywell is always willing to stand firmly behind their products. You can purchase Honeywell Digital Door Locks and an assortment of other security options such as Light Switch Timers, Shredders and a host of others all at the Honeywell Store.